Social & Content Marketing: Social Media Sins You Need to Quit! Social Media Sins You Need to Quit! Like anything, there is the good and bad to social media. 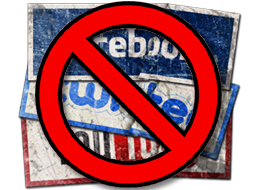 Be aware of these five social media sins and avoid them! You haven't posted for weeks. This is the same as not returning a phone call. Maintain contact with your audience, reply to their comments and make time to post. If you decide to stop blogging, for example, give your audience notice rather than stopping without a word. You post about everything you do. While it is good to be honest with your audience, there are somethings that are better left private. Know the boundaries before something slips or causes concern. Private messages are a great way to still use a social media platform, but privately. You use every social network created. Not all brands need to be on all networks. Know where your audience "hangs out" online and focus on being part of those networks. Plus, if you are using too many networks it can get overwhelming for users. Your profile picture is not you. I mean this in terms of personality and what it's actually a picture of. Avoid pictures of couples, pets, group pictures or children. Scenery or your brand's logo are ok. In the end you want a current, recognizable picture representing you online. Choose wisely. You post links or content that is misleading. Although you may have an excellent service to offer, don't promote it the sneaky way. Making false claims or posting links that go some place other than what you claim is annoying and creates distrust. Post quality content. Learn more about how to overcome these "sins" and how to give clients what they are looking for by signing up for my newsletter.